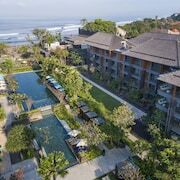 the staff is so friendly, great location in seminyak, centre of everything and great resturant around, also spas and nice clubs. Right in the heart of Seminyak, close to all restaurants and shopping, short walk from Bodyworks, Seminyak Square, beach and PotatoHead. 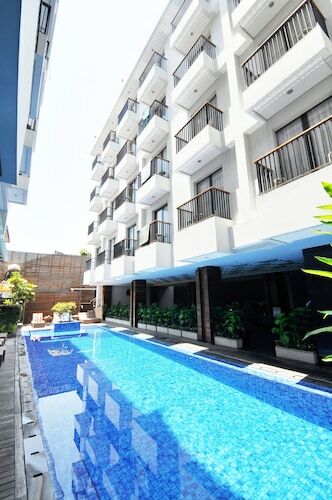 Firstly the accommodation is well priced and you do receive a very generous sized suite, its conveniently located between Legian and Seminyak so both areas are very accessible. Location is near some god food and drink places including Lucky Day & Capris Bar, Frankensteins, The 'Lady Boy Bars' and only a few hundred meters to the main Seminyak beach to watch sunsets, swim, eat, drink and buy 'museum of poor art' style paintings from passing hawkers. 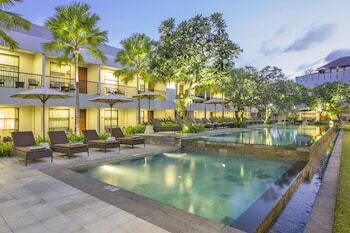 Great villa and resort hotel in the heart of Seminyak and all the action, but set out in such a way that once in side you could be anywhere it is so peaceful and tranquil. It has it all. Great facilities. Swim up bar with great family friendly games and activities. Three levels of pool. Restaurant has amazing food. Gym is well stocked. A departure lounge for late leavers. Staff are friendly, from reception, to bar staff to cleaners. The Breezes is close to everything; beach, shops restaurants, Commonwealth Bank ATM. 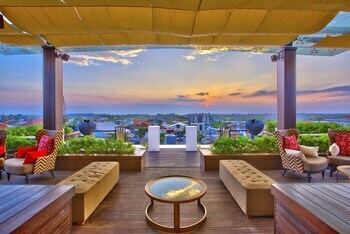 Seminyak may be a small region in a southern corner of a small island, but it still manages to pack quite the punch when it comes to entertainment and culture. 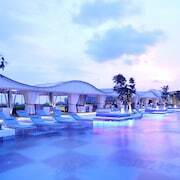 Sitting near Kuta in south Bali, Seminyak has been described as flashy. Home to many expats, this region of Bali is dynamic and full of night clubs, fine cuisine, art galleries, and lots of upscale boutiques. Of course, you can still take in breathtaking sunsets over the water and meander down the tranquil beach, where you will sometimes find traditional Balinese ceremonies taking place. 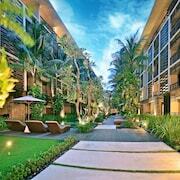 Hotels in Seminyak are very upscale. Picture spending your morning lounging at the side of a vast swimming pool, breaking for lunch at a trendy hotel restaurant, and getting a massage in the afternoon. 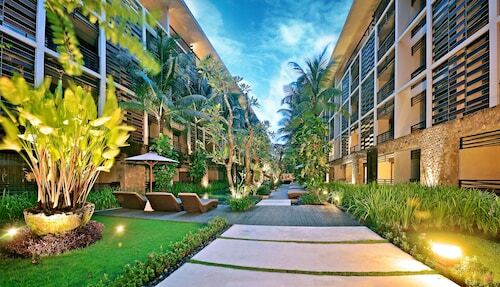 From private villas to well-appointed suites, accommodation in Seminyak aim to impress. Whether you are wooing your loved one all over again or heading to Bali with friends, it’s not hard to find a Seminyak accommodation here on Expedia.co.nz that offers a taste of the good life. 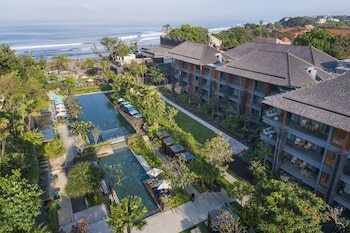 The easiest way to arrive in Seminyak is by flying into the Denpasar Airport (DSP) and then taking land transportation the rest of the way. Once you’re in the neighbourhood, you can hire a private driver, rent a bike, or take public transit. Boats will shuttle you between Bali and its neighbouring island, Lombok. 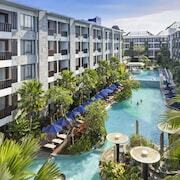 The temperature in Seminyak remains fairly consistent throughout the year with highs at about 30 degrees Celsius. 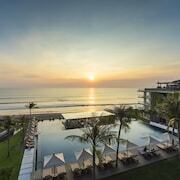 Pack your thongs, sun hat, and get ready to become a trendy beachgoer when you book a trip to Seminyak, Bali. This island community blends modern style and stunning natural beauty, creating the ideal travel destination for anyone living with wanderlust. Make sure you have a comfortable place to lay your head during your stay by booking one of the top Seminyak hotels here on Expedia.co.nz today. You can narrow down our large selection of hotels by theme, location, and amenities and book with confidence thanks to our low prices. 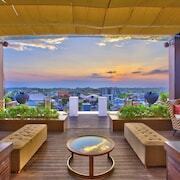 Explore Seminyak with Expedia.co.nz’s Travel Guides to find the best flights, cars, holiday packages and more!